Most granolas and cereals are typically made with refined sugar, which instantly turns them into a not-so-healthy food. As you probably know, I’m not a fan of refined sugar. It has been linked to weight gain, obesity, diabetes, inflammation, skin problems, cognitive decline, and heart disease. So why on Earth would anyone want to eat it?!! Well, because it tastes good. But, as luck would have it, there are a number of natural sweeteners that are gentler on the body, while still providing the sweetness we sometimes desire. So, whenever I want something sweet, I turn to foods like Paleo Passion Foods Grainless Granola that are naturally sweetened. There are a number of natural sweeteners that I prefer over refined sugar. Those include fruit-based sweeteners, such as dates, bananas, lucuma, and monkfruit, as well as maple syrup, raw honey, coconut sugar, and stevia. Fruit-based sweeteners come with added vitamins, minerals, fiber, and even protein, making them gentler on the body and healthier compared to refined sugar. Maple syrup is lower glycemic than table sugar, meaning it impacts your blood sugar less drastically. It also provides trace amounts of minerals and at least 24 different antioxidants, including phenolic compounds, which are beneficial for reducing free radical damage that can cause inflammation and contribute to the formation of various chronic diseases. Always choose the darker Grade B syrup for the most antioxidants. Raw honey has been used both as food and medicine for thousands of years. Research studies have shown that replacing sugar with honey in the diet results in less weight gain and lower blood sugar levels. Plus, it exhibits anti-bacterial properties, and has been shown to aid in sleep, and support digestive health. Coconut sugar is lower glycemic than table sugar, and provides trace amounts of minerals. It tastes like regular sugar, so is a great replacement for it in most recipes. I wrote more about it here. Stevia is a 0 glycemic sweetener, meaning it doesn’t spike your blood sugar at all, which is ideal. It’s taken from the leaf of a plant, and is up to 300 times sweetener than table sugar, so a little goes a long way. It doesn’t sometimes have a bitter aftertaste, so I typically use other sweeteners instead. Whenever I’m in the mood for something sweet, I choose or whip up foods sweetened with one of these natural sweeteners. No Refined Sugar! 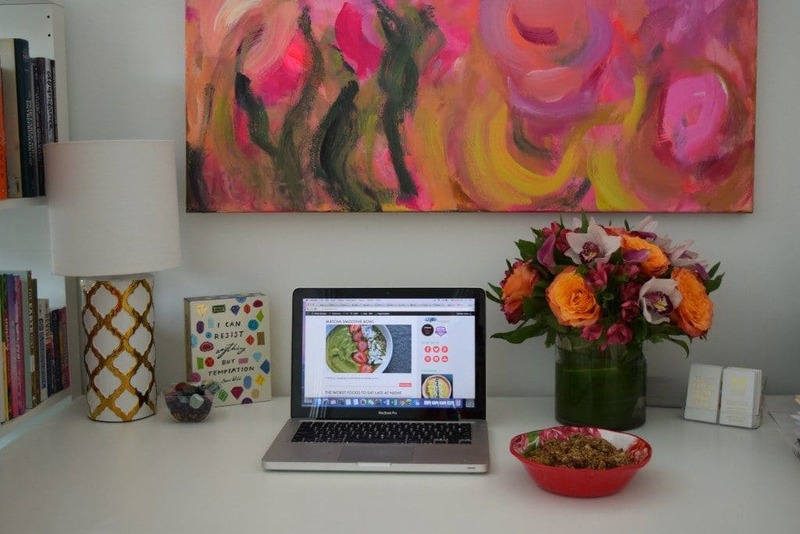 Paleo Passion Foods only uses wildflower honey and maple syrup to sweeten its granola. Wahoo! Grainless! It’s also grainless, and made with more nutrient-dense and health-promoting foods, including nuts, seeds, and coconut. These naturally provide the granola with anti-inflammatory omega-3s, protein, healthy fats, and fiber. Lower Glycemic! They even add in a bit of cinnamon to every flavor, which further helps to regulate blood sugar. No Nasties! 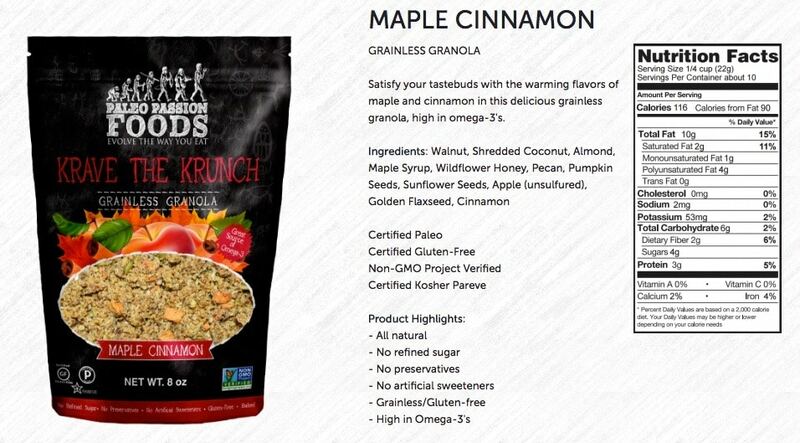 Of course, true to Paleo-form, there are no artificial nasties, preservatives, or refined ingredients here. The Paleo Passion Foods Granola comes in 3 flavors: Choco-Nuts, Maple Cinnamon, and Caribbean Coconut. It’s hard to choose a favorite, but I’m going to go with Choco-Nuts! put it in a bowl and pour homemade hemp milk over it. 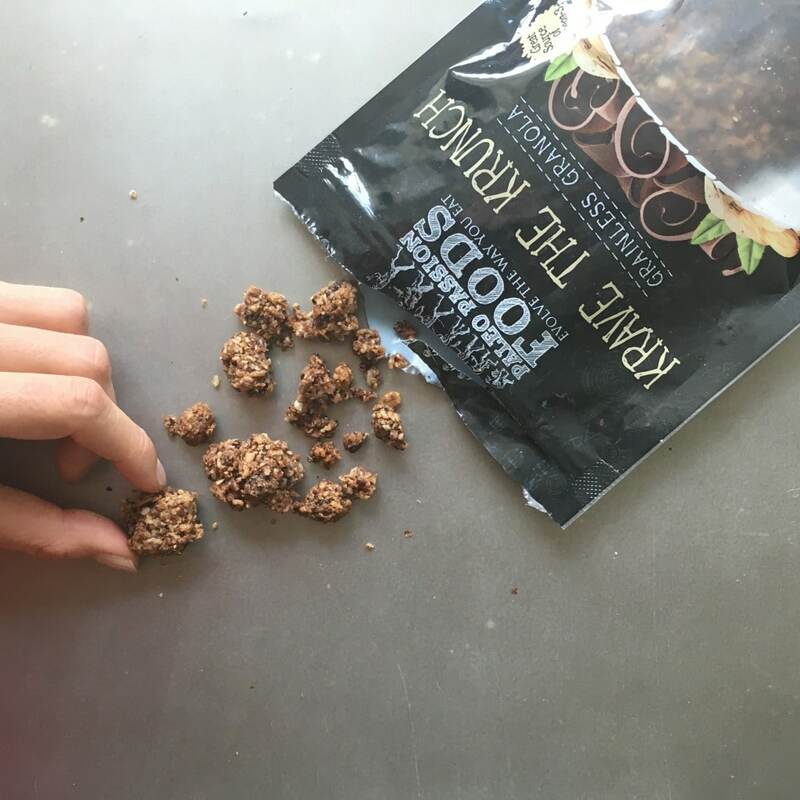 eat it right out of the bag as a snack (there are yummy clusters that you can easily grab with your hand or break up for cereal). 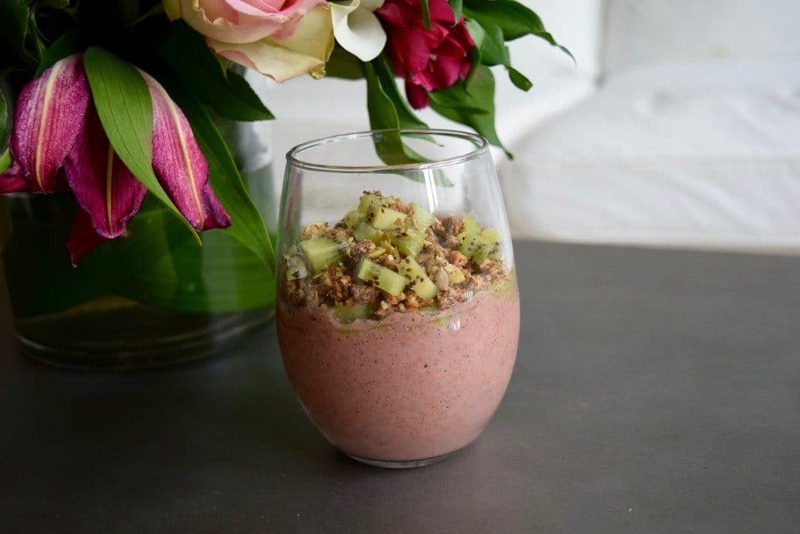 Top a Matcha Smoothie Bowl or any smoothie bowl! Because I love their products and company, I decided to partner up with Paleo Passion Foods to offer you a 15% discount to try their products! PLUS, at time of publishing this, they’re also offering FREE SHIPPING. Enter Maria15 at checkout on paleopassionfoods.com for 15% off. 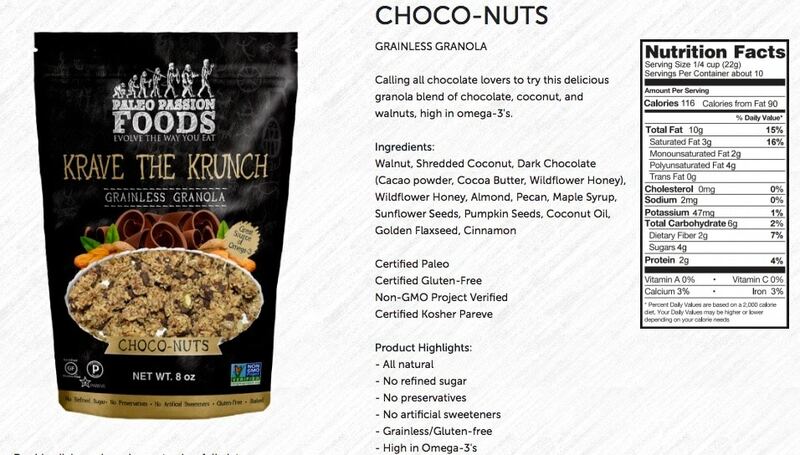 Additional Stores: You can also find Paleo Passion Foods granola on Amazon, Direct Eats, or in-stores across the country.